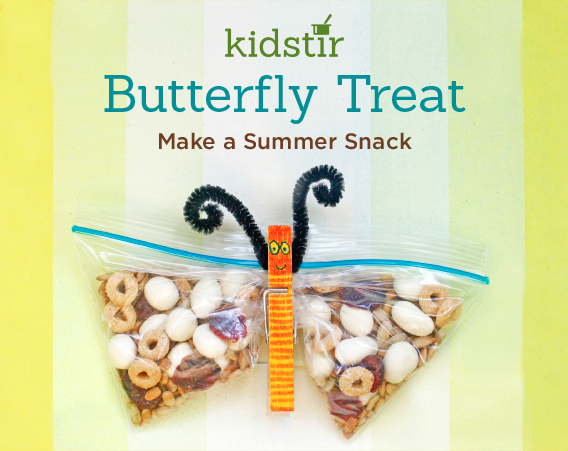 For a fun summer time snack, make and eat this snack-activity. In a medium-size bowl, stir together 1/4 cup of each of the following: dried cranberries or other dried fruits, granola or o-shaped cereal, nuts or seeds (sunflower seeds or walnuts), and yogurt covered raisins. Scoop the trail mix into sealable snack baggies. Seal the tops. Color clothespins with markers and draw butterfly eyes. Clip the clothespins into the centers of the baggies. Add pipe cleaner antenna.